First Aid - Defibrillator Info. Noosa Beach Classic Car Club is a not - for - profit motoring club located on Queensland's Sunshine Coast. It was formed in 1988, with a common interest of "Classic Cars", no matter what make, model or year. Excess funds from these events go to local charities and worthy causes. To date the club has donated over $190,000 to help causes such as Student Driver Training, Noosa Coast Guard, Riding for the Disabled, Rural Fire Brigade and many more. Club members participate in many other social activities such as interesting monthly motoring runs, dinners, our club Show 'n' Shine and sporting days. The club publishes a monthly magazine "Classic Lines" and keeps members informed of club news and events via this website. More information about the club can be viewed below. HISTORY OF THE NOOSA BEACH CLASSIC CAR CLUB Inc. The year was 1988 and Noosa, particularly Hastings Street, was going through a bad period in business due to a general downturn in investment and a slump in the stock market, not to mention, NO BEACH! There were 22 empty shops in Hastings Street and the general feeling from the traders was gloomy, so it was decided to have a “Beach Party”. A beach was created in Hastings Street by means of 10 tip-truck loads of sand, as there was none on the beach at the time. All sorts of ideas for entertainment were canvassed, one of them being a Street Parade with expo stilt walkers and a car show. Thus the 1st “Car Classic” was born. Only 10% of Lions Park was used and featured a “hospitality tent” with complimentary champagne, orange juice, beer and soft drink for the exhibitors. There was a $1 admission fee for the public and no charge for the exhibitors. The 1st “Classic Car Show” was a huge success and the number of cars grew rapidly each year, 47 in the 2nd year; 120 in the 3rd and now nearly 300 cars are on show. 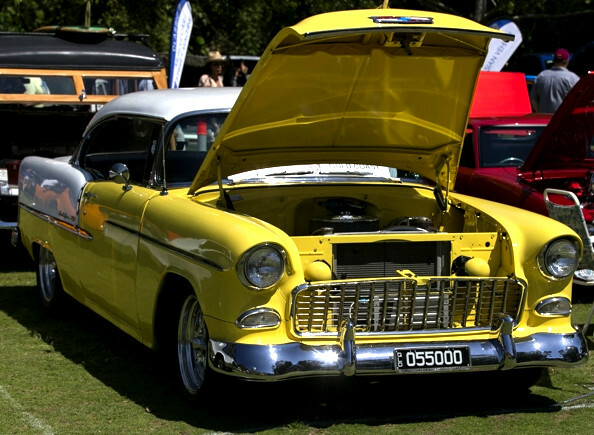 The Noosa Beach Classic Car Show has grown to be a premier car event attracting exhibitors from far & wide. In 1998 The Inaugural Historic Noosa Hill Climb organized by The Historic Racing Club of Qld, in conjunction with the Noosa Beach Classic Car Club, roared up “The Hill” at Gyndier Drive on the 21st & 22nd of November. Since then, this event has also established itself as one of the elite Hill Climbs in Queensland, also attracting competitors from far and wide. Noosa Beach Classic Car Club has donated in excess of $140,000 over the years to worthy charities and needy causes.